Active ingredients: natural lavender water, lavender extract, honey extract, echinacea extract, cocoa butter, sesame seed oil, grape seed oil. 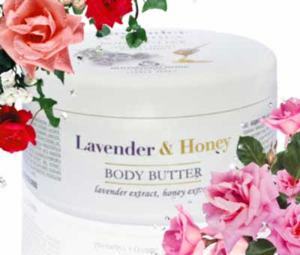 Body butter rich in natural plant oils and natural extracts, nourishes, moisturizes and strengthens the protective functions of skin. Hydrates and preserves its velvety softness and elasticity. Apply on skin after a bath or shower with light massage movements. Contains no parabens.